Leaves are changing and dropping, it’s now sweater weather, and Halloween decorations are everywhere. Things are also changing in the world of Washington state cocktails and spirits, with lots of exciting things happening. Check out the below for an overview, including an awesome local Kickstarter that's sure to be a hit with local cocktail lovers and a number of awards. This is an awesome idea from Barkeeper & Co., a Seattle company made up of folks with more than three decades of bartending. 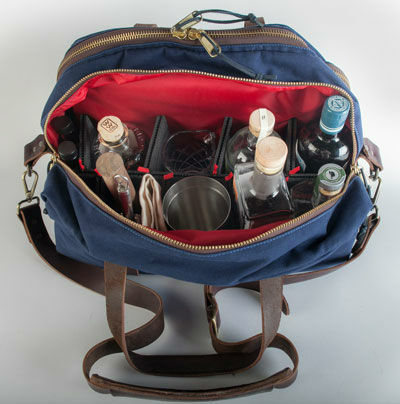 It's a functional, sturdy, bar bag designed from the ground up to comfortably hold everything a bartender (pro and home versions) needs. The B-Bag, as it’s called, carries everything you’d expect, from cocktail shaker to a bar spoon, but can also hold bottles, cell phone, and even extra clothes. It features a one-of-a-kind adjustable locking insert, too. The Kickstarter is only around for a bit more, so go support a local company and make your bartending easier. The toast celebrating this momentous occasion has already passed (it was September 30), but I’m all for continuing to spread the news: Three of our great local bars were recently named in the top 60 bourbon bars by the Bourbon Review, in partnership with Four Roses Bourbon. The bars are: Canon, Liberty, and Rob Roy, which are all awesome and were selected because of their bourbon selection and educational abilities. Justin Thompson from the Bourbon Review said, “The winning bars also have a reputation for creating both unique and traditional bourbon cocktails.” If you haven’t been to any of those three, well, what are you waiting for? Speaking of Capitol Hill’s Canon, it was announced today in London that it won one of Drink International’s World’s 50 Best Bars Awards. For the past five years, this global drinks industry magazine has been circling up nominations from more than 300 of the drink-world’s luminaries to round out its top 50 list. The awards include bars from all over, including U.S. bars in New York, Chicago, Seattle, Boston, Miami, San Francisco and Denver. So perhaps you should head up to Canon today and have to drink to help them celebrate? Seems like a pretty dandy idea. There’s still time to support our local spirit and liqueur makers up for the Audience Choice Award at the Martha Stewart American Made contest. Both broVo Spirits (which makes tasty, unusual liqueurs and now vermouths) and 2bar Spirits (which produces delicious vodka, moonshine and bourbon) are up for the award, and both are super deserving of it. These distillers deliver us such superior stuff to sip, it’s always good show our support in situations like this one. So, vote! And while you’re there voting, you should support swell Seattle ice-creamery Bluebird, also up for an award. Speaking of awards, Wildwood Spirits Co. (run by distiller Erik Liedholm and Chef John Howie) just picked up the “Best in Show” award at the New York World Wine & Spirits Competition for its Kur gin, which garnered a double gold medal. Kur’s been picking up a host of awards since its recent release, and is a fantastic addition to the line-up of delicious gins being put out in our state. We may need to change the state name to Washing-gin if this keeps up! The company’s Stark Vatten vodka was also received a silver medal award at the prestigious event. Both award-winning spirits can be found at all John Howie Restaurants, along with local stores, bars, and restaurants.